50% of my profits from sales of this photograph on ImageKind will be contributed to the fight against Cancer. 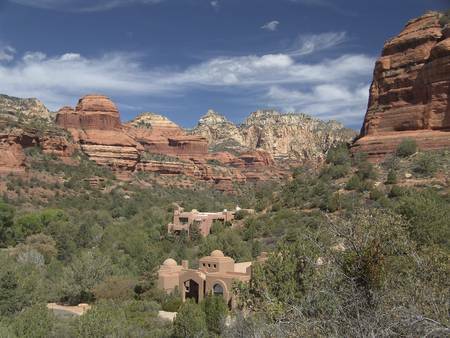 This is Boynton Canyon, Sedona, Arizona on an April morning, overlooking the Enchantment resort. The foot trail is just visible, a little right of center and under the red rock cliff. Imagine yourself rising before dawn, drawn into the open canyon floor full with blooming Manzanita bushes. In a cliff nook, above, are the ruins of an ancient dwelling of the Sinagua people. Eventually, the trail passes into ponderosa pines. Put your nose to the bark to savor the warm butterscotch aroma in the canyon's heart. This caught my attention second to cathedral, but look at the history in this one. And the power in the sky. Neutral density? Very beautiful! I like the lines in the rock and the dark blue sky. Love the detail and the clouds which mimic the striations of the cliffs. Beautiful capture! I have to agree with Ann - the clouds do seem to mimic the rock and carry you further in to the image.